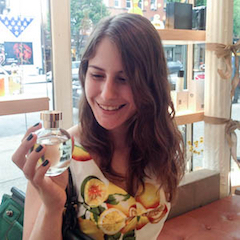 Interview with Natalie of “Another Perfume Blog”! I find Natalie’s reviews for Another Perfume Blog to be extremely thought-provoking, especially on the subject of how perfumes are sold to us. Natalie thought that I was funny long before I did, for which I will be forever grateful. Today she tells us about the perfume that captures “her childhood in a bottle”, and offers an excellent suggestion as to how we can improve the “uneasy relationship” between perfume bloggers and perfume companies. Why do you write about perfume? Earlier this year, I decided I wanted to better understand perfumes and my responses to them. I’m not very good at thinking about things in an abstract way; I have to order facts and ideas in my mind in some way to analyze, understand, and remember them — and the way I do that best is by writing. I decided to blog because it was the forum available to me and suited to the kind of personal writing that I wanted to do. Since a lot of my professional work involves writing, I also wanted a space to write for myself. You wrote an excellent article on the distrust that some perfume companies seem to have for perfume bloggers. What steps do you think that both sides need to take to begin building that trust? I don’t know if there is mistrust between the two, but it certainly seems like an uneasy relationship. Before I give any more detail, I should say that my perspective on this is evolving, and I’ve purposefully avoided the conflicts that I’ve seen in the perfume blogosphere, and will probably continue to do so. (The two exceptions: I defend the English language and sweet Austrian bloggers from uncalled-for assaults.) But to answer your question with my perspective as of this minute, I think a good starting point would be for both sides to remember that neither owes the other anything except the respect and courtesy we hopefully show to everyone we meet. I think erasing a mindset of “this for that” would lead to more honesty from both sides, which would in turn produce more meaningful and more interesting dialogue. At the same time, being respectful and courteous would go a long way toward preventing misunderstanding and bad feelings. And it is simply the right thing to do. What are your favorite perfume houses? I love Guerlain for the opulence of its real masterpieces. For me, Guerlain is the height of romance and the house that embodies how I want to feel about my life every day. I am also enamored of Tauer Perfumes. Andy’s creations are consistently among the most evocative perfumes I know. Lonestar Memories is my childhood in a bottle. Ormonde Jayne is another favorite. I love smelling my way through the line and feeling like I’m smelling variations on a theme, like illuminating portions of a painting. I also really like Parfumerie Generale, because I haven’t smelled much in the line that hasn’t smelled really, really good. What is your favorite place to shop for perfume? My favorite place to shop, full stop, is Nordstrom. If they carried all my favorite perfumes, I’d never go anywhere else. But since they don’t, I do. Whenever I can, I try to buy directly from the perfumer, because I assume that this results in the largest profit for them (if this isn’t true, I hope someone will correct me). I also really like Barney’s in San Francisco. Their perfume counter staff is knowledgeable and the selection is very good. In terms of local stores, Barney’s is my pick for niche perfume shopping. You mentioned that your husband thought that your (very different) wedding perfume options all smelled the same. What does he think about your interest in perfume? Does he have any interest himself? He has zero interest. Truly. Zero. But, he is really supportive of my interest and has been wonderful when it comes to my blog. He is currently helping me with a logistically challenging post that will probably not see the light of day for months (and will not strike anyone as anything spectacular when it finally appears! ), and he couldn’t be more cheerful or johnny-on-the-spot about it. What are some of your other interests outside of perfume? I have a very strong interest in trying anything once. But I also love to read, travel, practice yoga, dance, and obsessively reorganize things. What perfumes are you hoping to find under the Christmas tree/Menorah branches this year? I actually didn’t ask for any perfumes for Christmas. I was really fortunate to have gotten several amazing perfumes this year, so I am feeling like I have enough. But since I imagine everyone else (like me!) likes to see names, I will share a few of those I am wearing often lately: Miriam (Tauer), Reglisse Noir (1000 Flowers), Coffee & Cedar (Plume Perfumes), Bellodgia (Caron), and Mahjoun (DSH). Next ›What Is The Role of A Perfume Blogger? Tara, I’m so happy to hear that you enjoyed the interview! Once all of the interviews have been published, I am actually planning to make a “perfume bloggers’ guide to perfume shopping” shopping guide of their favorite stores! Ari, that perfume bloggers shopping guide is a great idea! I also like Nordstrom and would happily do all my perfume shopping there (I even managed recently to by one of Chanel Exclusifs from my favorite SA at the local Nordstrom). Oh! I have so many questions! But I’ll try to restrain myself. What was the strangest thing you’ve tried once? My husband does wear perfume now! It’s very cute. On (casual) Fridays, he puts on a teensy tiny amount of … Polo Pony 2. (I think it’s 2, it’s the red one) That bottle is going to last for years, before it joins the abandoned bottle of Aqua di Gio in the medicine chest. Hmm. The strangest thing I’ve tried once. What comes to mind is going to play bingo at a VFW or Knights of Columbus hall (or something like that) when I was in my mid-20s. I thought I would be surrounded by people from a completely different generation and walk of life, doing something I hadn’t done since grade school when the prizes were Scholastic Book Club points, and I thought it would be fun and weird. And it was! Sorry, I missed your question. Cuir de Russie. Love it. Thank you so much, Suzanne. That’s an amazing compliment. Pardon me while I pause to grin. 🙂 As for Lonestar Memories, I haven’t reviewed it, but I do want to. It’s a scent that I have a hard time wearing, but that I love to the depths of my soul. It usually ends up being sprayed on a strip and put into my bag or my makeup bag. In fact, it’s time for me to replenish my decant. Oh no, it’s ok! I actually took that photo down, too. I felt weird having it up there, so it was just a temporary thing. And I don’t know what you’re talking about with all this “I’m only occasionally funny” business. You crazy! Your hilarious! I Love Natalie!!! and I love her glasses and the collar and the hat!